How have we come to depend so greatly on the words terror and terrorism to describe broad categories of violence? 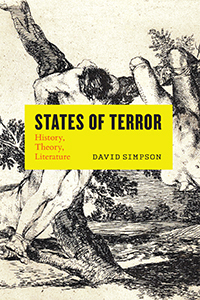 David Simpson offers here a philology of terror, tracking the concept’s long, complicated history across literature, philosophy, political science, and theology—from Plato to NATO. Introducing the concept of the “fear-terror cluster,” Simpson is able to capture the wide range of terms that we have used to express extreme emotional states over the centuries—from anxiety, awe, and concern to dread, fear, and horror. He shows that the choices we make among such words to describe shades of feeling have seriously shaped the attribution of motives, causes, and effects of the word “terror” today, particularly when violence is deployed by or against the state. At a time when terror-talk is widely and damagingly exploited by politicians and the media, this book unpacks the slippery rhetoric of terror and will prove a vital resource across humanistic and social sciences disciplines. 2 What Do We Talk about When We Talk about Terror?